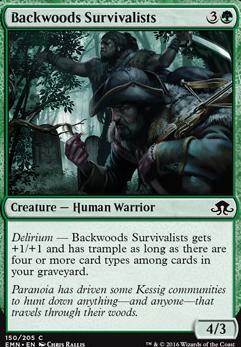 Delirium - Backwoods Survivalists gets +1/+1 and has trample as long as there are four or more card types among cards in your graveyard. 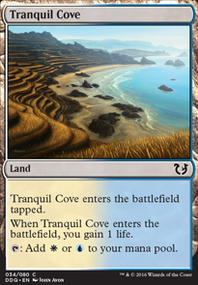 Having only played the format three times, i don't have a full grasp on the format yet, but i'll weigh in on my first impressions. 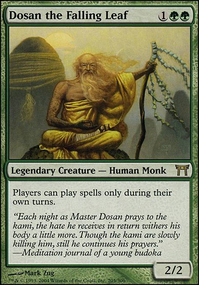 The W/G humans deck is really solid when it comes together.Important commons include Crossroads Consecrator, Backwoods Survivalists, Prey Upon, Choking Restraints and Sigardian Priest. There are a number of uncommons as well. 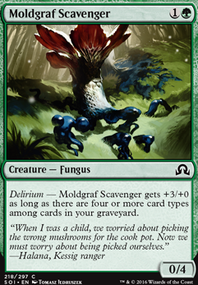 The deck is beat down, and is at its best when it can flood the board with potent threats early. Red beatdown is also a thing, splashing one of the other colors. Does not rely much on synergy, but you could potentially go B for a more streamlined vampire/madness-deck or green for a werewolf deck. 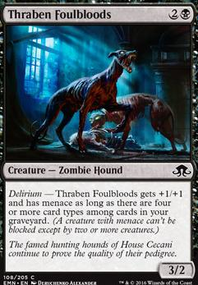 Delerium has also gotten a lot of neat cards with EMN, the big ones being Backwoods Survivalists and Boon of Emrakul IMO. 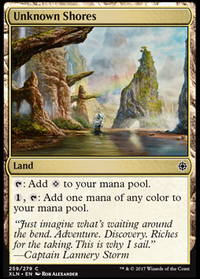 Have not yet seen a dedicated U/G emerge deck yet, and i suspect it being because it wants a lot of uncommons. I opened a Lili in my pool and I saw her in every round that I played in. Sometimes twice or three times a round. Did not get to play her every game however. I can say though that she did underperform a lot for me. I'll preface this with saying that I did manage to go 3-1 at prerelease. So I didn't build a deck that was terrible, maybe I just wasn't using her right. If we talk about her plus one for limited purposes, we see that there are a total of 54 creatures, in this limited environment, that her plus one can outright kill. One of those is a mythic, Eleven are rares, Twenty-Five are uncommons, and seventeen are commons. And with the distribution of Eldritch Moon to Shadows packs (2 Shadows and 4 Eldritch Moon) a great deal of these will not be seen do to probability. Some of these may also be just bad filler cards that won't get played regardless if they were in your pool. So the average sealed deck may contain anywhere from 2-5 creature cards that Lili will be able to outright kill. Her plus one is good at slowing down a big creature, but it does not feel like it does enough to slow down a bigger creature. Her plus one is not that fantastic at protecting her as one might think, it would definitely be better if it was -1/-2 (it isn't though, so I digress). And if you intend on getting to her ultimate than you need to use her plus one and try to protect her at all costs. This is the reason I lost two games, I was focused on trying to get to her ultimate to hopefully take control of the game. My opponent knew this as well so I was chump blocking and losing creatures trying to get her to her ultimate. If you don't want to invest in her then her minus two is fine. Nothing spectacular. There was a few times when I found myself with no creatures or no good creatures in my hand and did not want to risk milling a removal spell or something that I would like better than a Weirded Vampire. Her minus two feels like a bad Macabre Waltz or Cemetery Recruitment. And you may have a better chance at getting one of those in your pool. And clearly her ultimate would most likely be completely back breaking to your opponent in limited if you got there. Overall, I feel like she underperformed greatly. Even for a three casting cost planeswalker. Sometimes you may not have anything to protect her well enough that early. And other times you rather just play a creature. And when she does hit the board your opponent focuses all of their effort into killing her. So if you get her I recommend dropping her into play, using her plus one and using her as meat shield while you get ahead on your board. 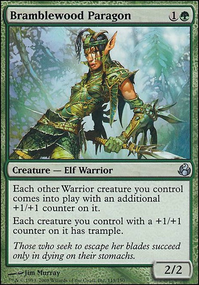 In very first game of the prerelease, I was on the draw, I dropped her on turn three and was able to plus her up to shrink a Mournwillow down to a 1/1. I passed the turn to him and he played a Backwoods Survivalists and put Lili back down to three loyalty with his Mournwillow. He passed back to me and I played a Niblis of Frost and put his Mournwillow back to a 1/1 and passed to him. He then promptly played a Somberwald Stag, fought my Niblis and killed Lili with his other guys. And while he may have gotten the perfect draws that game, I would have much preferred Lili had been a Murder or anything else honestly. And the ensuing game that I played her went much like that. Me trying to protect her and getting nowhere because her plus one just isn't good enough. 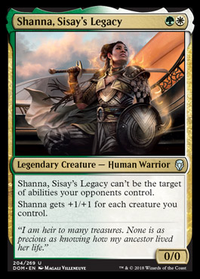 By the end of prerelease when I saw her, whether it be a late game top deck or in my opening hand. I just held her in my hand until I wanted to bring a creature that I cared about back to my hand. Then just left Lili to her fate. Hell, I wasn't even mad when one game the guy played Pick the Brain and exiled her from my hand. If I could've chosen one card that I just didn't care about it would have been Lili. So, she is definitely playable. But, not spectacular whatsoever.